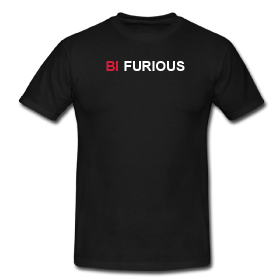 We have a new web-based shop with an ever-growing range of fabulous bisexual slogans on badges and t-shirts. 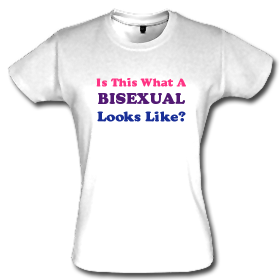 Bookmark this link: The Bisexual Index Shop and we'll add more soon! And if the slogan you want isn't available in the colour or garment you want, let us know by email! "#BiPride" - New for 2014, get ready for Celebrate Bisexuality Day with our new Bi Pride t-shirt! "biPad" - because someone's going to make this joke and we might as well do it ourselves, right? 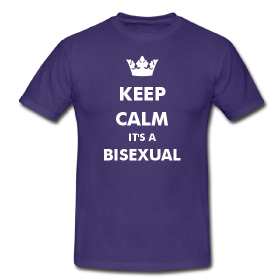 Keep Calm It's A Bisexual! Are you causing needless panic? Or maybe you want to give off a false air of safety? Either way, this is the shirt for you! Your choice of colour, but we like red and purple best. 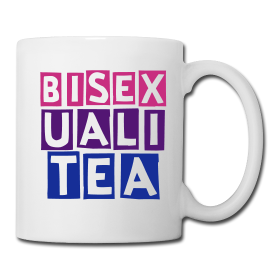 "Bisexuali-TEA" - Show your pride as you imbibe! 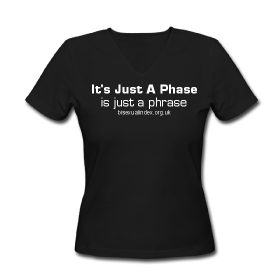 We think that "It's Just A Phase" is just a phrase, so now here's a t-shirt for people who agree! "There Is No Fence" - something some people have a hard time accepting! Your choice of colour on this shirt, also available on a bag. 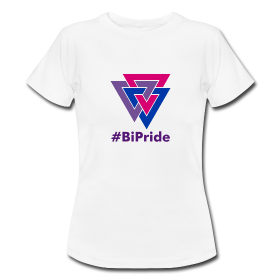 The Bisexual Symbol - It's that bisexual symbol we keep using - here it is on t-shirts, badges and even a laptop sleeve! 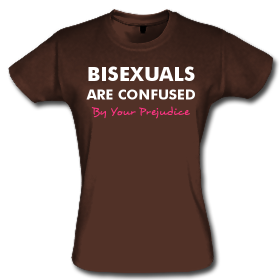 "Bisexuals are Confused". Confused by your prejudice, that is! 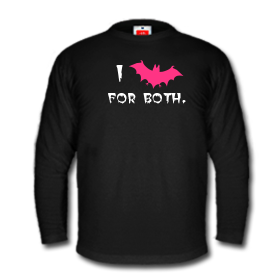 "I Bat For Both" For lovers of puns, and goths. And goths who love puns. "Is This What A Bisexual Looks Like?" 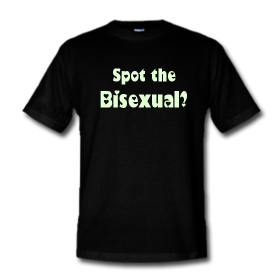 One for you or your non-bisexual friends! "BiFurious" Some of us aren't curious, we're furious! Show your ire in this attire! 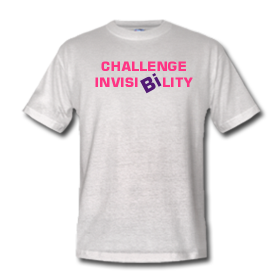 "Challenge Invisibility", again with your choice of colour for the shirt. 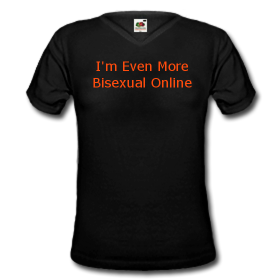 "I'm Even More Bisexual Online" Because some people are, especially on Second Life. "I Only Look Straight" Or do you? This T-Shirt probably won't help you blend in. "Spot The Bisexual?" Become easy to identify with this glow-in-the-dark slogan! 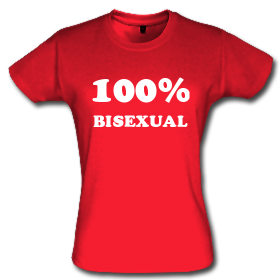 "100% Bisexual" - because there's no 50-50 half and half two-ways about it!